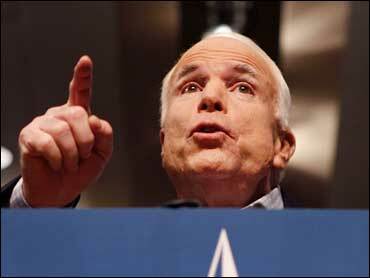 Republican John McCain is calling Democratic rival Barack Obama a liar. The GOP presidential candidate told a campaign rally: "Sen. Obama has accused me of opposing regulation to avert this crisis. I guess he believes if a lie is big enough and repeated often enough it will be believed. But the truth is I was the one who called at the time for tighter restrictions on Fannie Mae and Freddie Mac that could have helped prevent this crisis from happening in the first place." In some of the harshest language yet, McCain said the campaign comes down to a simple question: Who is the real Barack Obama? "All people want to know is: what has this man ever actually accomplished in government?" McCain said. "What does he plan for America? In short: who is the real Barack Obama?" McCain drew the loudest cheers when he said the Democrat has written two memoirs but "he's not exactly an open book." McCain also said that Obama and Democrats in Congress "encouraged" the corruption at Fannie Mae and Freddie Mac that led to the subprime mortgage meltdown. "As recently as September of last year he said that subprime loans had been, quote, 'a good idea' Well, Sen. Obama, that good idea has now plunged this country into the worst financial crisis since the Great Depression." The Obama camp has charged that McCain is trying to charge the subject away from the economy, as McCain's poll numbers have been sinking along with the Dow Jones average, reports Bentley. But Obama said today that the economy should remain front and center on the campaign. "I've got news for the McCain campaign - the American people are losing right now, they're losing their jobs, they're losing their health care, they're losing their homes, they're losing their savings," Obama said. "I cannot imagine anything more important to talk about than the economic crisis, and the notion that we'd want to brush that aside and engage in the usual political shenanigans and scare tactics that have come to characterize too many political campaigns, I think is not what the American people are looking for." Meanwhile, Republican vice presidential candidate Sarah Palin expanded her own attack on Obama's character on Monday to include his relationship with an incendiary former pastor as well as his ties to 1960s-era radical Bill Ayers. In the process, Palin toned down her description of the Obama-Ayers relationship after her weekend remarks were criticized as exaggerated, but at the same time she embarked on a discussion of Obama's relationship with his former pastor, the Rev. Jeremiah A. Wright Jr., which McCain had signaled he did not want to be a part of his campaign. In an interview with conservative The New York Times columnist William Kristol published Monday, the Alaska governor said there should be more discussion about Wright, Obama's pastor of 20 years at Trinity United Church of Christ in Chicago. The Democratic candidate denounced Wright and severed ties with the church last spring after videotapes surfaced showing Wright making anti-American and anti-Semitic comments from the pulpit. Wright had appeared to be off limits for the McCain campaign ever since McCain himself condemned the North Carolina Republican Party in April for an ad that called Obama "too extreme" because Wright was his pastor. He asked the party to take down the ad and said, "I'm making it very clear, as I have a couple of times in the past, that there's no place for that kind of campaigning, and the American people don't want it." When Kristol pressed Palin about Wright, she replied, "I don't know why that association isn't discussed more, because those were appalling things that that pastor had said about our great country." She continued, "To me, that does say something about character. But, you know, I guess that would be a John McCain call on whether he wants to bring that up." At a morning rally in Florida, Palin kept up her criticism of Obama's ties to Ayers, a founder of the violent Weather Underground group blamed for several bombings during the Vietnam War era, when Obama was a child. The Illinois senator has denounced Ayers' radical views and activities. "This is someone who sees America as 'imperfect enough' to work with a former domestic terrorist who targeted his own country," Palin said of Obama. That was a tamer description than Palin used at rallies in California and Colorado over the weekend. In her earlier attacks, Palin had said that Obama "pals around with terrorists." News reports pointed out that Obama was eight years old at the time of Weather Underground bombings and that the two men do not know each other well although they live in the same Chicago neighborhood, have served on a charity board together and Ayers hosted a meet-the-candidate event when Obama first ran for state office in the mid-1990s. Obama responded to the renewed controversy over Ayers on the Tom Joyner radio show today. "I served on a board with him. And so now they're trying to use this as guilt by association, and as you said, they've explicitly stated that what they want to do is to change the topic because they don't want to talk about the economy and the failed policies of the last eight years." Later, Obama adviser David Axelrod told CNN the Illinois senator "didn't know the history" of Ayers' Weather Underground activities when Ayers hosted the 1995 gathering. Speaking in Estero, Fla., Palin responded, "Today they're saying for the first time that Barack Obama didn't know back then about Ayers' radical background." Meanwhile, a poll conducted by the nonpartisan Pew Research Center over the weekend found that just over half of registered voters view Palin favorably and about four in 10 think she's qualified to be president, essentially unchanged from a week earlier, before her debate with her Democratic rival, Joe Biden. Biden's positive image improved slightly to 63 percent, and those saying he's qualified to be president grew to 77 percent, the same poll showed.